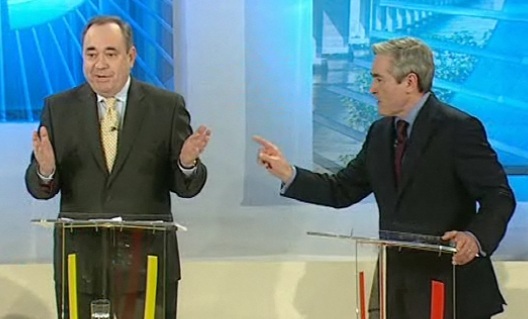 politicalbetting.com » Blog Archive » Did the first debate further Labour’s Scottish challenge? Did the first debate further Labour’s Scottish challenge? Last night the fight for control of the Holyrood parliament and who should be Scotland’s First Minister had its first major set piece – a leaders’ debate broadcast by STV. You can see it in full here. This was the first time I’d really watched Scottish Labour leader, Iain Gray, in serious action and my impression was that he’s better than many non-Labour Scottish posters have suggested – but that’s not saying much. His challenge is that he’s up against Alex Salmond who has all the benefits of incumbency as well as being one of the sharpest operators on the UK scene. It was good political entertainment and yet again I found myself impressed by the Scottish Tory leader, Annabel Goldie. She, however, is not a contender although could find herself holding the balance on May 6th. Gray, who has seen the polls tightening in recent weeks, was clearly pumped up and appeared desperate to get one over on Salmond. In that he failed and at times he came over as being far too aggressive. The screen-shot above sums it all up: Salmond is addressing the TV audience at home – Gray is addressing Salmond. My overall impression is that Salmond is going to be very difficult to over-haul and I’m not sure that Gray’s body language and general approach will have done him and his party much good. Still there is a long way to go. Labour might be helped by the SNP being too clever by half. There’s a new poll from YouGov out which the party issued with comparisons on a previous poll that showed most movement – rather than the last survey from the pollster. This is a practice that infuriates me. They’ve got a good news story – why try to pull a fast one? At the Scottish elections in 2007 ICM came out top. My betting: After seeing the debate I increased my betting against the SNP coming out with most seats. Ladbrokes had them at 9/4 with Bet365 at 11/4. If the SNP do it then May 6th looks set to be a nice pay-day.